A Sustainable Approach to Resilient Floor Care Maintenance. 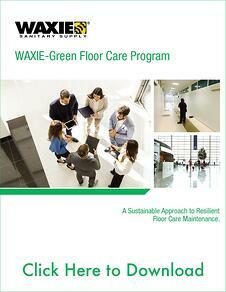 The WAXIE-Green Floor Care Program is a sustainable system approach to resilient floor care maintenance, designed to reduce operational costs through labor and maintenance savings, while maintaining or improving aesthetics and environmental impact. With the WAXIE-Green Floor Care Program, floor finishes are more durable to extend stripping frequency and reduce necessity for scrub and recoat. This results in less labor to maintain, less energy and water from maintenance programs, and lower total operational costs. All while retaining appearance and continuing to protect hard flooring. High-quality WAXIE-Green™ products incorporate the latest cleaning technology to deliver superior cleaning results, and are certified to meet the most stringent green cleaning standards. In addition to providing top-quality cleaning performance, WAXIE-Green cleaning products reduce the potential impact on human health, as well as the environment. WAXIE-Green products offer an impressive combination of performance, price, health and safety, along with environmental standards you can be proud of! WAXIE-Green Hi-Gloss Floor Finish is ECOLOGO CCD-147/UL 2777 Certified and utilizes the latest self-crosslinking technology to produce a high quality modified acrylic floor finish without the use of metal-crosslinkers. This unique chemistry provides unparalleled high gloss and offers superior detergent resistance, gloss retention and black heel and mark resistance relative to conventional metal-free finishes. WAXIE-Green Armor II Floor Finish is GS-40 Certified and a premium metal-free floor finish with high gloss and extreme durability and resistance. Exceptional resistance to foot traffic and water/detergent, while still responsive to burnishing and restoration. Designed to become harder and more durable over time with cleaning. Extremely high coverage for faster application with less material. WAXIE-Green Advantage Plus Floor Finish is ECOLOGO CCD-147/UL 2777 Certified and an economical, metal free floor finish with moderate gloss and extreme durability and resistance. Extremely resistance to foot traffic and water/detergent, while still responsive to burnishing and restoration. Designed to become harder and more durable over time with cleaning. Extremely high coverage for faster application with less material. Ideal for use in areas where low odor is most critical and extremely high gloss may not be desired. Meets ASTMD2047 standards for slip resistance. WAXIE-Green Floor Stripper is Green Seal GS-40 Certified and is specifically designed to remove WAXIE-Green Floor Finishes, but it also removes most conventional metal-crosslinked floor finishes too. This fast acting and pleasant to use stripper removes multiple layers of finish without harsh alkalies and other conventional components. Does not contain hazardous or corrosive materials. WAXIE-Green Maravilloso Lavendar Neutral Cleaner & Degreaser is ECOLOGO CCD-147/UL 2777 Certified and is a high dilution neutral cleaner and degreaser ideal for maintaining all WAXIE-Green Floor Finishes. With daily cleaning, improves hardness, durability and life of these floor finishes to reduce maintenance expenses. Pleasant lavender fragrance. Your WAXIE Account Consultant can provide additional information about the techniques discussed and make product and equipment recommendations for your specific requirements. Contact us now for your personalized Hard Floor Care Solutions!